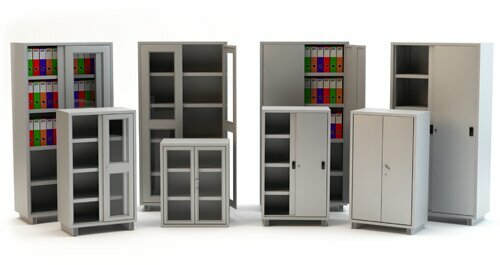 Filing cupboards are one of the classic and ideal office file storage system. As office filing cupboard manufacturer and supplier we have studied the customers need, accordance to that we have wide range of office filing cupboards. Now a days there is increase in cost of land, due to which we need to manage the space thus we have different heights of the cabinet which servers the numbers of customers. There different door option such as glass door and sliding doors, we also have file dividers on shelf of office filing cupboards to organise the documents in order and create easy access. Three way locking system with 2 keys. Door option such as glass door and sliding doors. Door are reinforced with stiffeners for high door stability. User friendly arrangement of the interior fittings due to adjustability in 75 mm steps. Load carrying capacity of upto 40 kg per shelf and drawer.